On this trip we decided to spend the first week on the lakeside Camping Alpenblick on the outskirts of Interlaken. 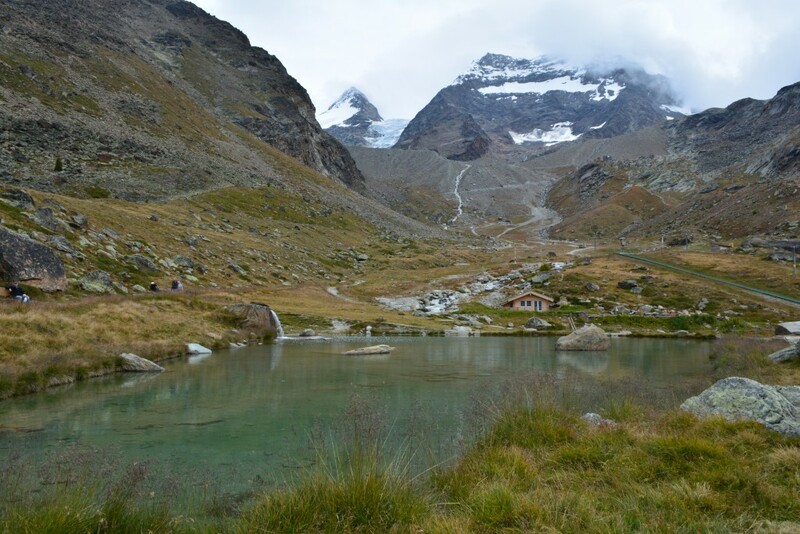 Using this site as a basecamp was ideal, as the bus stops outside the site (free local bus-pass from campsite included in daily Tourist Tax 5.6 chf(£3.7) ). Interlaken translates as “between lakes” very apt with the beautiful lakes of Thun to the west and Brienz to the east. With the prospect of various modes of travel to explore locally, by way of walking, cycling, using the buses, trains or cable-cars we thought a combination of transport might be a good idea and help our ageing legs last the day. So with a dry sunny forecast we caught the bus to Interlaken. We wanted to explore higher so took the funicular railway up to the heights and delights of Mt. 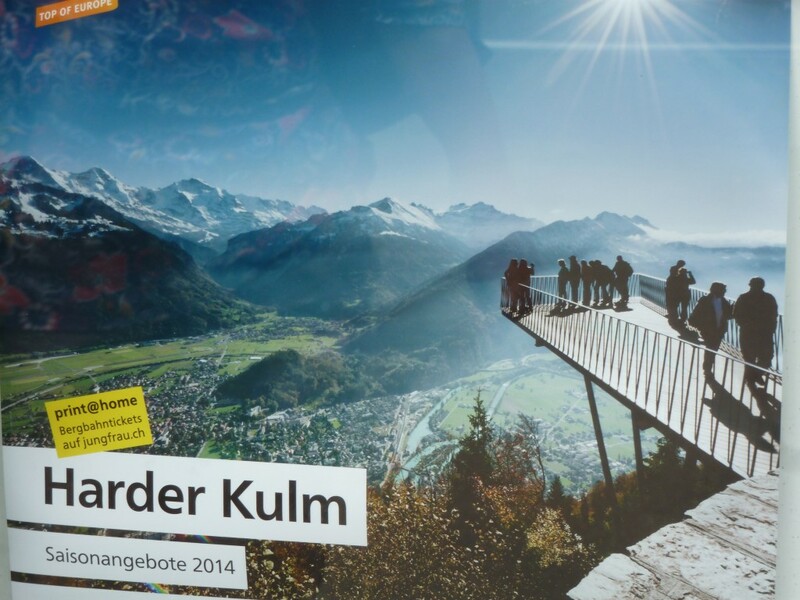 Harder Kulm. The mountain top restaurant and Skywalk give splendid views out to the turquoise lakes and the hang-glider wings as they drift down to Interlaken below. After a photo session of mountain scenery normally only seen on television travel shows, we stayed up there a while and enjoyed a walk in the cool of the trees on this lesser known mountain. As usual the trails are well signed with the easily seen yellow finger posts telling time/distance to the relevant place. Still blessed with fine weather next day a cycle ride was planned on the nearby N380 cycle trail from the campsite. Being on the flat valley floor this was an easy going 17km. ride, first through the woods and fields to Unterseen and Interlaken, then alongside Lake Brienz. Turning to cycle back through the old village of Bonigen you then chose either the canal bank or quiet little lanes (which we did) to circle back to basecamp. 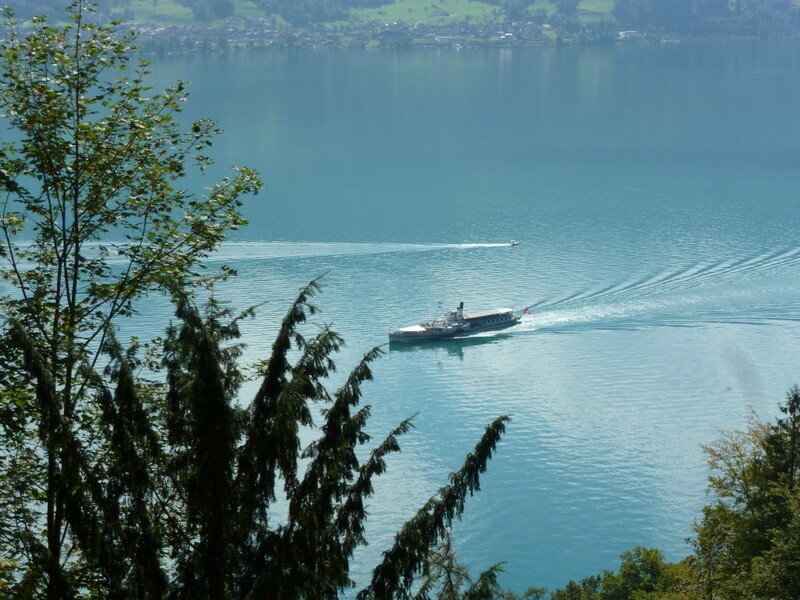 Across the road from the campsite and alongside Lake Thun lies a Nature Reserve. One afternoon’s stroll over there we were lucky to catch sight of a Black Squirrel, not a creature you see every day. Several hours were spent there or at the edge of the lake chilling out and watching the ferries criss- crossing the sparkling waters. With the magical backdrop of the surrounding mountains you just wish time could have stood still. 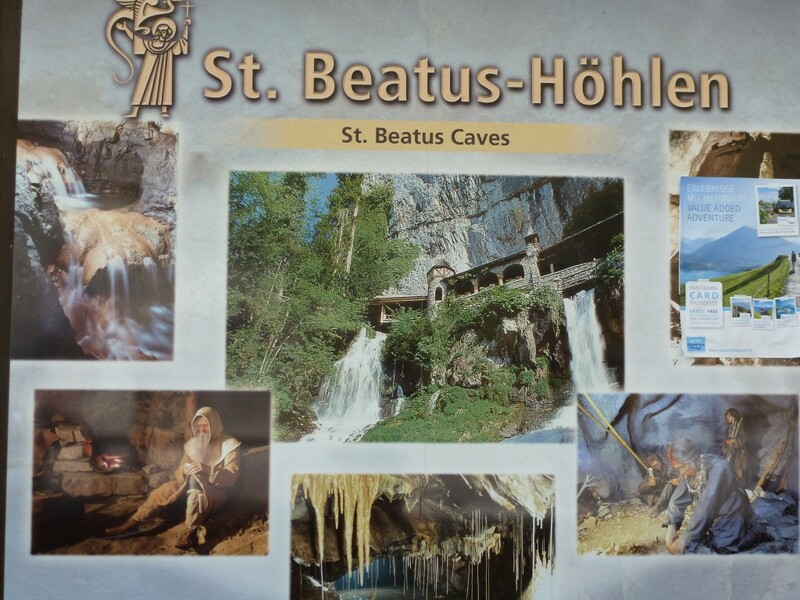 Another day we jumped on our free bus to venture along the lakeside a little way to the hillside caves of St. Beatus Hohlen. Alternatively there is a lovely lake/hill side walk or even the ferry boat to get you near there. 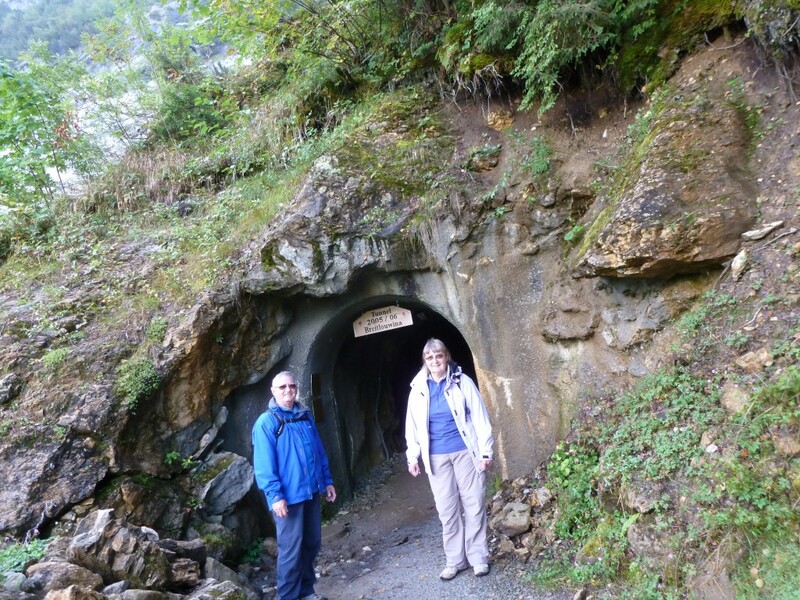 After paying our 16 chf (£10.5) each the guide leads you for over a kilometre deep inside the mountain cave system, quite impressive with stalagmites, stalactites, waterfalls, pools and low passageways. Then another kilometre back, even then there was a lot more shut off to the general public. The story goes that in days of old a hermit lived there who created miracles. Also up there on the mountain side with glorious views over the lake is a little veranda restaurant with a water cascade below. Worth a visit on your descent is the new Museum, complete with a film of caves around the world. All too soon it was time to pack our covered wagon and move out. 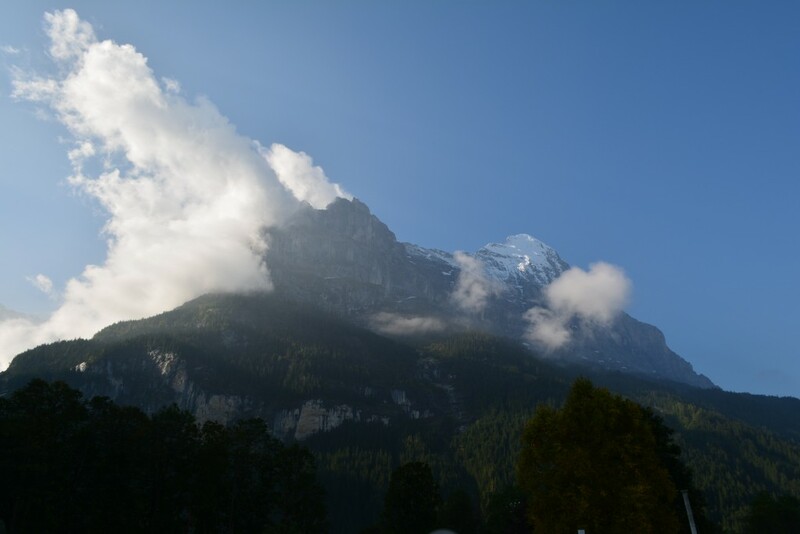 With a good weather forecast we enjoyed the scenic drive into the mountains and the wonder of Grindelwald. With a backdrop of the mighty Eiger with its notorious North Face and the lush valley between, this is a camping ground to dream of. Here we stayed on Camping Gletscherdorf and awoke with the snow-topped Eiger and its glacier framed in our vans window. 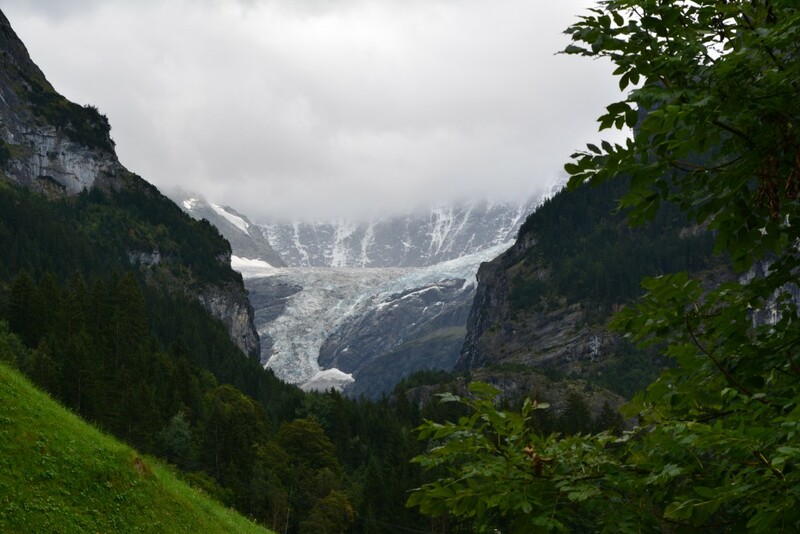 After a slow start to check the weather was turning out as forecast, we set off for a mountain walk on the Mettenberg, a mountain on the opposite side of Eiger’s glacier. Still in our leg saving mode we caught the cable-car part way up to Pfingstegg, to start the walk (Trail No 23) on the lower slopes. The walk was mostly on the contour line, so not too arduous. Part way along a gorge has become impassable so in 2006 a curved tunnel was blasted in the mountain-side above to allow you to continue, complete with automatic lights as the end wasn’t in sight. Lunch was taken on a rock at the apex of our walk under the shadow of the awesome looking Mt. Wetterhorn and the sound of the rushing melt water in the river Lutschine below us. Then it was a steady stroll along The Terrace Walk and over the fields back to our home on wheels, a great day out. Next day rain was the order of the day, so we embarked on a low level walk alongside the river and along the valley. After crossing the little bridge where the creamy river water is joined by a clear hillside stream, we watched the colourful hang-gliders drift gracefully to earth in a field. Then to warm the inner-person it was up to Grindelwald village for a real Swiss hot chocolate drink in our regular little caf’e overlooking the Eiger Mastiff, now with low cloud swirling menacingly around it. 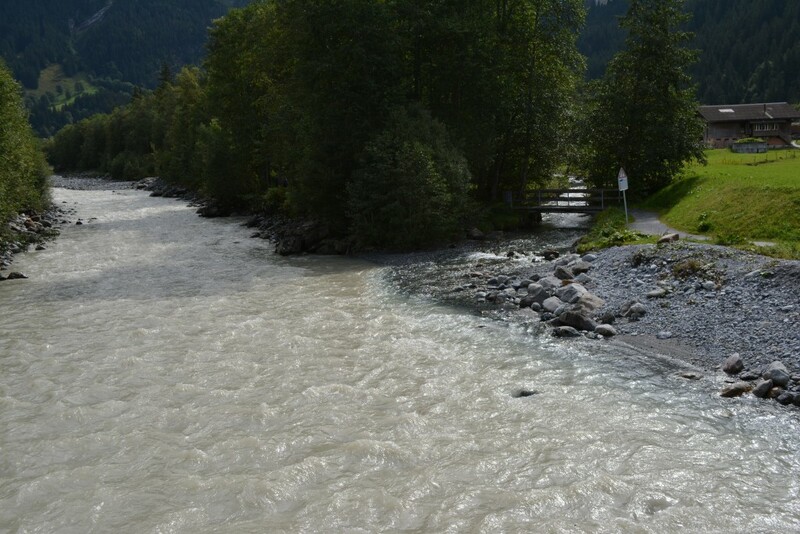 “An old local tale goes that in times past the nearby Lauterbrunnen people said the Grindelwald valley folk were so dirty they made their river run black when they washed. 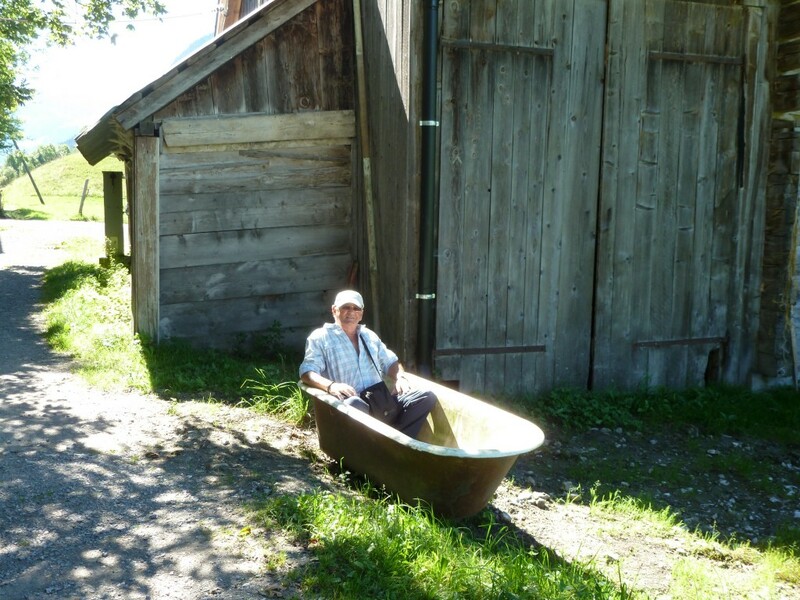 In turn they retaliated, saying the Lauterbrunnen valley folk never washed, that’s why their river ran white.” They all seem clean nowadays. A few more days of chilling out and low local walking and it was time to meander back down the winding road to continue our Swiss mini-adventure. Having decided to next head for the southern Sion Valley and its tempting side-shoot high mountain villages, we set off along the switch-back narrow roads towards Aigle. On the way stopping off at lovely Zwiesismmen for a couple of nights and enjoyed some more pleasant river-side walks. We must be toughening up, as no help required by cable-cars etc. 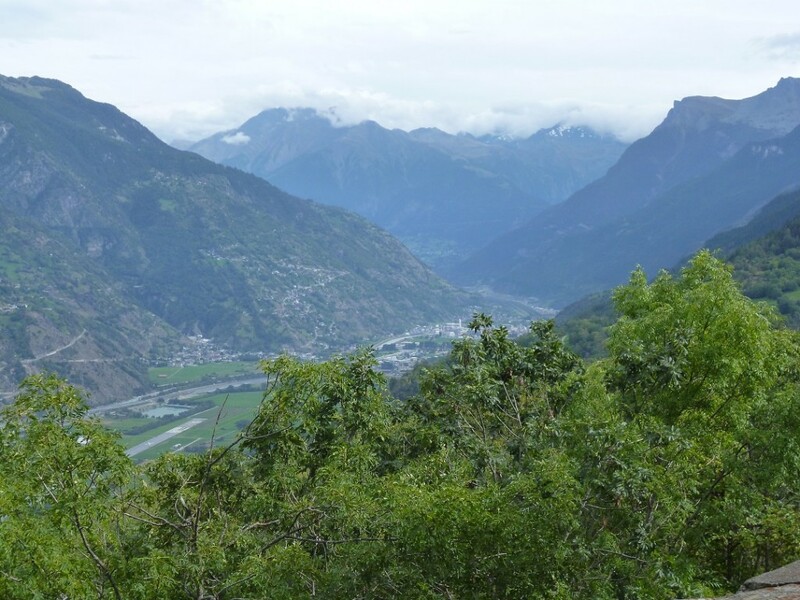 Our campsite, Camping Vermeille, could be used as an ideal base for an extended stay as various means of transport, trains, buses and cable-cars all operate from the village. Also there are local shops including a large supermarket to top up provisions. Sometimes the facilities are a bit basic. Once in the broad fertile Sion Valley there are lots of campsites. We carried on for a while then turned right and pointed upwards to the Saas Valley, not for the too faint-hearted, and the wonderful mountain village of Saas Grund. Garmin didn’t like being this close to the mountain sides and kept losing the satellite signals. Not a problem when on the only road going up there but it would have been nice to see the hairpins coming up on screen. Once up there on our campsite, it was noticeably colder, although sunny, so a brisk little walk in the trees and alongside the river soon warmed us up. Our campsite, Camping Am Kapellenweg, now has to charge an additional compulsory 15chf (£10) per day Tourist Tax. Admittedly this does enable you to the free Pass for the bus service and free cable-car lifts in the Saas Valley Holiday Region, so we used them both. To eke out our leg muscles on next days venture to the high ground of Spielboden (a ski/walking area above the resort of Saas Fee), we made use of the Post-bus up to Saas Fee then the cable-car further up to Spielboden. Arriving up there it was much colder but breathtakingly beautiful, overlooking the village below one way, down to the tongue of the glacier another and the higher snow covered mountains behind. Then to crown it all the Marmots came out to show off. One was brave enough to feed on some carrots left out for them. A photographic delight. As the trail back down to the village appears very exposed to the elements we took the cable-car down. From the cable-car we noticed there were dozens of snow making blower machines on the ski runs, which we haven’t seen on previous trips here, climate change maybe. Down in the village a stroll round the car free streets was met with the tempting aroma of fresh coffee from the veranda style restaurants and cafe’s. We were going to walk the next bit down to our campsite on the apt named Kapellenweg trail (which passes 16 tiny hillside chapels) but the start has been obscured by building works. So we caught our free bus back down, seems to work well this Tourist Tax. Another great day in the clear mountain air, pleasantly exhausting. Next day dawned cold again but still dry so another cable-car trip up the mountain on the other side of the village. We had never been up to the resort at Kreuzboden so were keen to explore. First another lovely river-side walk through Saas Grund to the lift station then whisked up to the even colder walking area of Kreuzboden. There are several marked trails to take you further up or back down or other places on or around the mountains flanks, we settled for a short nearby stroll. The views from near the precariously perched restaurant veranda were spectacular. One thing that puzzled us was that in the small shallow lake were fish, o/k till winter but surely it must then freeze solid. The choice of downward transport was between the cable-car or large wheeled scooters you rode yourselves, we took the former. 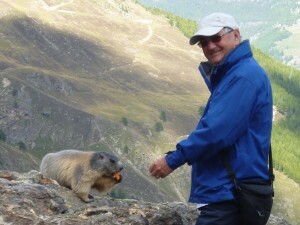 Saw more Marmots frolicking on the hillside on the descent. Think overall we saved quite a bit using the Local Tourist Tax Pass, it probably encouraged us to use the various means of transport and maybe see more than normal, so no complaints. Just to be able to walk in the majestic Swiss Alps is a privilege. The cold and being, for us at least, at a high attitude was beginning to tell after a few days so we decided to seek lower ground and head for the Sion Valley again. The first campsite down there was an old favourite, Santa Monica at Raron. As is the norm there are numerous walks from the site, a popular one The Kapellweg, zig-zag’s up the hillside behind the site, passing several tiny chapels till it climaxes on a narrow terrace at a lovely peaceful small church. We were glad of the chance to shelter there once when caught in the rain. An afternoon’s stroll over to the main part of Raron took us to the two churches. One fairly traditional and set high on the hillside, evolved a steep climb to reach. The other is definitely not traditional, being blasted out of the solid rock underneath the other church. With room for 500 people it really is impressive, the ceiling is just sprayed white over the bare rock, looking like clouds. You enter in the dark then the lights come on slowly and the silent power of the place stuns you. The village’s two cable-cars start off in buildings next to each other and then head upwards at a tangent to separate destinations several kilometres apart with a gorge between. In the morning with a forecast of low cloud and drizzle we ventured up with the first cable-car to the small pretty mountain village of Unterbach. After getting our bearings we set of to walk cross country to the other cable-car station in the village of Eischoll. Once on our way we easily followed the well marked trail through woods, over several steams and along a narrow terrace path all in light rain. At one clearing there was the remains of a campfire and strings of Prayer Flags hanging in the trees. On breaking cover the views out over the valley and beyond were spectacular. After some interesting undulating sections we came upon Eischoll. A charming place, old wooden houses bedecked with red Geraniums and a lovely large white church, as is the norm the doors were open. As Sylvia later wrote in our log-book, “These were true mountain villages”. A brief food-stop in the little square then we returned on the other cable-car to Raron. Down in the valley it was warm enough to sit outside the van and enjoy the sun and a glass of white. Time stands still for no man they say, with that in mind we headed out of the valley’s end to spend our last few days in Switzerland on the shore of Lake Geneve. Enjoying the peaceful Camping Rive-Bleue at La Bouveret tempted us to unhitch the bikes and cycle on the easy flat dedicated cycle trail to the next lakeside village of Villeneuve. As most of the trail is through a reserve it was no surprise to see deer and heron. On the way there is a tall viewing hide overlooking Lake Geneve. Villeneuve village was well worth a stroll around with its dozens of small craft and general shops; topped off by having lunch by the lake watching the kite-surfers performing on the turquoise water. Posted in Switzerland | Comments Off on Our lastest Swiss adventure.